Be honest. Do you secretly (or not so secretly) resent your clients? Whose fault is that, anyway? Back when you had a “day job” if you hated your boss, didn't you do everything in your power to find another job? Wouldn't you do your utmost to find a better solution or would you remain in a job that you hated? Now that you are a virtual assistant, (and an entrepreneur!) 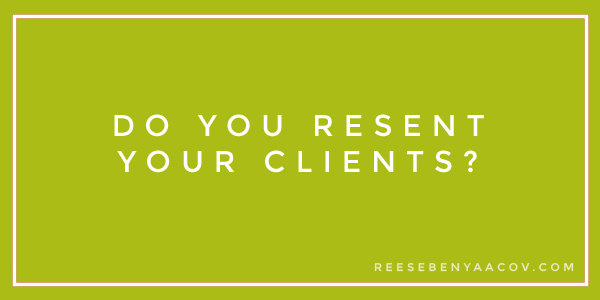 are you allowing your clients to treat you like you're subservient to them? Like that one crummy boss you had a long time ago? Do you answer emails past 10pm? Do you allow your clients to disturb you with phone calls during your off-hours? Is your client nit-picking about your invoices, forcing you to justify your work and level of dedication? Do you feel that if you don’t do all the above, there will be a consequence? There is a difference of doing what is best for your business and doing what is best for your guilty conscience. It’s time you know which is which. If you don’t stand up and plant your flag in the ground, then your clients are going to walk all over you. Be firm yet professional with your clients about your availability and be even firmer with those clients who do not respect your boundaries. Be confident about the time you submit on your invoices, and if you have a client who nit-picks month after month about every single item on your invoice it’s time to kick that client to the proverbial curb. You're a business owner, too, and that means that you get to pick and choose who you work with and you deserve respect. But to get respect you have to demand it and that comes by being confident about the value that you bring to the table. What ways are you letting your clients walk all over you? Leave a comment below and let us know how you are going to change that, starting now! Tweet this post out to your followers on Twitter by clicking here. Show some tenacity and rock on! Should You Cold Call Potential Clients?